Is the un-tagging of the untagged tag happening? There are currently 120 questions tagged untagged. I assume we will need a shiny diamond special user to handle them, seeing as how some of them are locked for historical significance. I think that untagged is very useful, as it is a clear indication that a question is in need of some attention. The specific attention that most of the questions that have the tag need is burnination -- even the ones that are open are crap questions (I have no idea how that "R" question is still alive). I don't think that it is an issue of people using the tag (you cannot create a question without any tags, nor can you explicitly specify untagged when creating or editing a question; I just tried it and the system told me off). It does, on the other hand, make the place look a bit untidy and unmaintained. If some kind souls want to start weeding the garden, and let me know which questions need shiny diamond powers, I'll help out where needed. 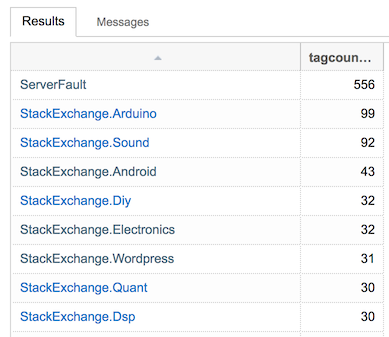 I wrote a SEDE query which compares the number of untagged questions across different Stack Exchange site. It turns out that ServerFault is really an outlier with over 500 questions; there's no other site with more than 100 untagged questions and only two others with more than 50. 579 locked untagged questions (= +1 since sept 21, 2015, obviously out of my control because of my rep). [untagged] closed:no locked:no only returns 5 more hits. [untagged] closed:yes locked:no only returns 9 more hits. So for the unlocked questions, the counter went down from 114 to 5 + 9 = 14 more hits ... That is 100 questions that got resolved (and also explains my +100*2 rep increase since I started ...). I don't understand why retagging a duplicate "untagged" question with the very same tag (as the duplicate) gets ... rejected! If, IMHO, question 1 is classified as a duplicate of question 2, then their tags should be identical also (instead of one of them having "untagged" as tag, go figure ...). Check for yourself if "you" have any inspiration about which tag to use for the remaining (closed:no and closed:yes) ones ... I've really tried to find "some" tag, but about 4 of them for which I had (I thought) found a tag my suggested edit got rejected. So be it, I'm not going to take a risk of running into a suggested edits ban ... By the way, after you complete the closed:yes and closed:no questions, you should see a few more questions which seem to not be closed:no and also not be closed:yes ... (what am I missing, closed:maybe ???). [untagged] is:q phpmyadmin (2 remaining, retag with phpmyadmin?). [untagged] is:q plesk (4 remaining, retag with plesk?). [untagged] is:q cpanel (5 remaining, retag with cpanel?). [untagged] is:q inventory (7 remaining, retag with asset-management?). [untagged] is:q outsourcing (5 remaining, retag with hosting?). [untagged] duplicate:yes (22 remaining , use same tag as the duplicate question?). [untagged] is:q mcse (7 remaining, retag with test ... or something better?). Hope my answer will wake up "somebody" (with "shiny diamond powers" ???) to further reduce (at least) those 14 not-locked and 52 locked questions. PS 2: Merci (oeps: thank you) to all the suggested edits reviewers over the past few days who approved those about 100 suggestions. And for those who rejected some of them: don't worry, I understand (one can't have 100% approval rates ...).